There are times when it pays to play Horde. My Belf Demon Hunter took a step back in time and started working on the Laughing Skull Orc rep in Draenor. The Lsorc(?) rep was hanging out in the Trading Post, so why not grind up the rep and get some cool transmog masks? Grinding the rep out in The Pit was a cakewalk, and once he reached Revered he picked up a couple of the available masks the vendor had locked away. But hiding behind the Exalted tag was a grinning skull mask with gold highlights, as well as a title. 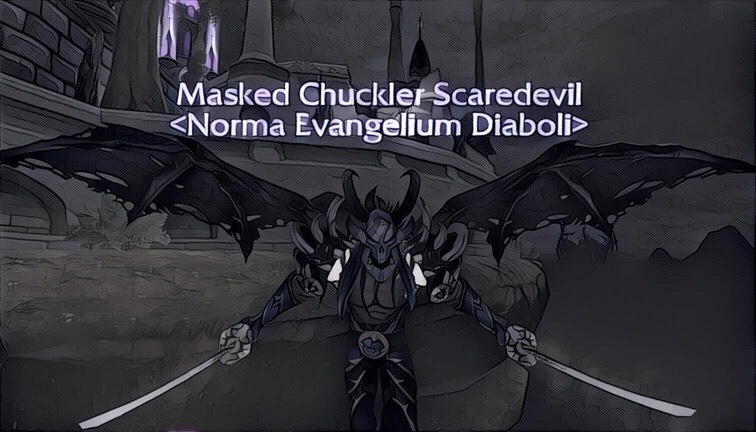 The title was a worthy goal, since masks are cool and everyone enjoys a good belly chuckle now and then. And the mask? A skull, and gold. Two of my favorite things. Earn Exalted status with the Laughing Skull Orcs. A few more sheckles of gold and he’ll have his new mask, but for now my boy Scaredevil will just have to live with being the Masked Chuckler. I swear, he becomes more of a Luchador every day.